I’ll start with the “Emerging Technolgies” bit. Imagine a spectrum of technology, with pure theoretical Research at one end. This is long-term thinking – stuff that we might be seeing in ten years. At the other end of the spectrum is product Development. This is the proven technology in off-the-shelf software today. If this sounds like I’m implying that our Software Group products don’t use cutting-edge technologies, I’m not. But it stands to reason that software products which enterprise customers use to build the architecture of their business use tried-and-tested technologies. “Emerging Technology” bridges the gap between these two. It’s the short-to-medium thinking – stuff that might be mainstream in three to five years. It’s the stuff that isn’t new enough anymore to justify calling it Research, but is still so new that you can’t find it in off-the-shelf products. The “Services” bit is that we’re a customer-facing group. We provide consulting and technology services to clients, helping them to understand what is possible and how it could help their business. Our remit is to explore and investigate emerging technologies, and a lot of it is learning-by-doing. By that, I mean that a big part of how we learn about emerging technologies is through delivering first-of-a-kind demos, pilot projects, and prototypes for real customers. This makes for a fun mix of work. Some of the most fun bits have been one-off days with customers: running workshops, participating in discussions and ideastorming, and giving briefings and presentations on emerging technologies. It’s talking and handwaving stuff, mostly. I’ve done this with a wide variety of customer types, such as utility companies, mobile network operators, retailers, airlines, banks, councils and government and civil service departments. Some customers want more detailed work: outlining a solution, or proposing how something could be done. The requirements vary, from creating storyboards and slideware, to writing documents and high-level architectural proposals. And some customers want to see the real thing for themselves. This means creating a chunk of code for a demo. Typically this is code that doesn’t need to have a long shelf-life – the emphasis is on quickly hacking something together that demonstrates the art of the possible and makes it come to life. In short, my job is great. It’s varied and often a little frantic as I juggle a few overlapping projects or clients. 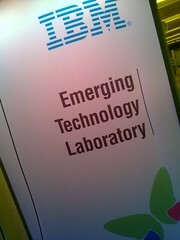 I get to play with cool toys, and learn from a lot of fascinating people – inside and outside of IBM. This entry was posted on Sunday, February 21st, 2010 at 10:30 pm and is filed under ibm. You can follow any responses to this entry through the RSS 2.0 feed. Both comments and pings are currently closed.